Not much to look at but so good! I have always made mushroom soup with dried and fresh mushrooms but this time at a whim I added canned mushrooms for their very meaty texture. What a good move! I use can mushrooms on my pizza because fresh ones have a tendency to get leathery. Fresh mushrooms just don’t have the same bite as sliced button mushrooms from can. This change is permanent for my soup. Again, change the amounts to your taste. What follows is just a suggestion. 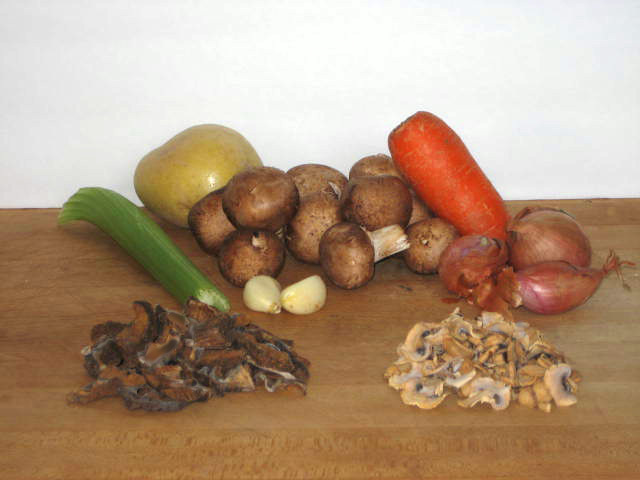 Soak dried mushrooms in hot water for at least 30 minutes. When fully reconstituted remove, squeeze and roughly chop. Strain the soaking liquid into another container using coffee filter or pouring it slowly leaving sand behind. Reserve. Sauté onions and fresh mushrooms for 5 minutes or till soft. Add dried mushrooms and garlic and sauté for another 3 minutes. Add potatoes, carrots and celery, sweat for 3 minutes. Pour in stock and reserved soaking liquid, bring to boil, lower temperature to simmer and cook, covered, for half an hour. Serve as is or remove about ½ to ¾ solids with slotted spoon or small strainer, reserve and with immersion blender liquefy rest of solids till smooth then put back reserved solids and marjoram, reheat and serve. Of course, you can add 35% cream for a really rich taste and mouth feel if you want. I usually blend the leftover next day with addition of cream and dried potato flakes for cream of mushroom soup. Note: Since I have picked wild mushrooms with my family since I was 5 years old I used mushrooms that I have picked and dried myself. Other option is to buy Cremini in bulk when they are on special, slice them thin including stems, I use mandolin, and dry them on a large tea towel or newspaper in 1 layer, turning over once a day until dry.